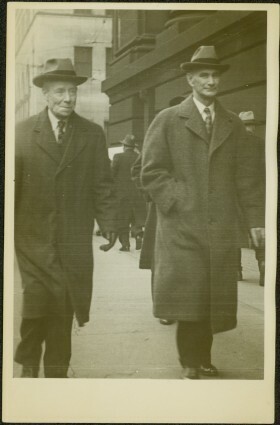 The pair walks on sidewalk, wearing hats and long coats, Glassey on right. Crowd of walking people and tall buildings in background. Photograph taken by street photographer. Stamped annotation on recto of photograph: "SOUVENIR SNAPS 401 W. HASTINGS ST. VANCOUVER, B.C. EXTRA COPIES BY NUMBER." Item is part of the Taylor-Baxter Family Photograph Collection. See also items 2009.5.2.15 & 2009.5.2.301 for images featuring similar content. Handwritten annotation on recto of photograph: "80561E."